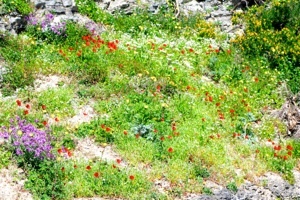 The Wild Flowers of Skopelos Blog. Resembling butterflies and visited by bees. At this time of year, when the grass grows rapidly in fields, olive groves and even on derelict sites, a search amongst the green folliage will reveal flowers, which resemble brightly coloured butterflies; they were formerly called papillonaceae. They belong to the genera, Lathyrus, Vicia and Pisum, commonly known as peas. The structure of the pea flowers has evolved in codependency with bees, which are necessary for their cross pollination. The bees are attracted by the bright coloured upper petal, the standard, the sweet smell of nectar and the promise of pollen. The bees weight, landing on the side petals, the wing, opens up the keel petals which hide the pollen bearing stamens. The pollen is picked up on the furry body of the bee and pollen from other flowers is transferred to the style to fertilise the female parts of the flower to allow the development of the fruit. The fruits are pods and the seeds are peas. Each kind of flower has a special relationship to a group of specialised bees. Five new flowers have been added, all are Faboideae - the pea subfamily of the pea family. All the peas are edible, though not all tasty, but need to be eaten with caution. Almost 700 plants including grasses, shrubs, trees and ferns, as well as herbaceous plants have been recorded by botanists visiting Skopelos and many of these plants come into bloom in springtime. The annuals and biennials completing their life-cycle before the hot dry months of summer. Skopelos is recognised as the Green on Blue Island, but in spring there is an explosion of colour, with many plants opening their flowers during the months of March, April and May. The brilliant reds of poppies and yellow chrysanthemums; the more subtle pinks of centaurea, cistuses and geraniums; cool blues of campanulae and lupins; purples from pale the pale mauve Knautia integrifolia to the deep magenta of wild gladiolae and a variety of white Apiaceae, with their umbrella heads, create a scattering of colour on the green island. Five new flowers have been added; all of which come to full bloom in April. Eight new plants, all added can be considered, by some, to be weeds. Weeds are not recognised as a botanical entity, but they have been given different definitions by different people: a plant not sown in a field by a farmer, a plant not planted in a garden by a gardener, or a valueless plant growing wild. Possibly the best way to regard a weed is as the wrong plant in the wrong place at the wrong time. Over recent decades it has been recognised that many weeds have positive environmental effects. They can provide habitats and food for wildlife, including some rare moths, butterflies and birds; they can be a good source of nectar for bees; they may contain useful chemicals or dyes and some, like poppies, are attractive and have positive aesthetic qualities. Many weeds are highly nutritious; this is well recognised by the Skopelitians who are very knowledgeable about edible wild greens and collect them as horta. One man’s weed is another man’s flower and, in some cases, his lunch.